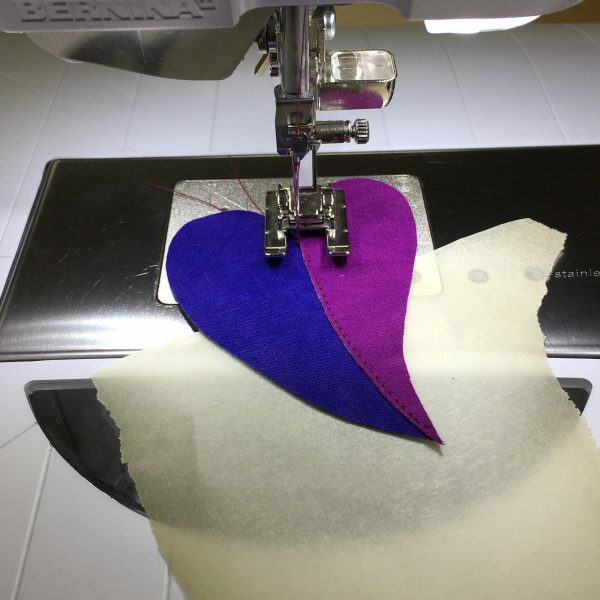 Here’s a tip from quilt artist Jane Sassaman to help you manage small appliqué shapes with tracing paper. I make appliqué quilts. My compositions grow from arrangements of shapes, usually inspired by nature. By backing the fabric with an iron-on interfacing (I use ShirTailor by Pellon) I can treat the fabric a little more like paper. 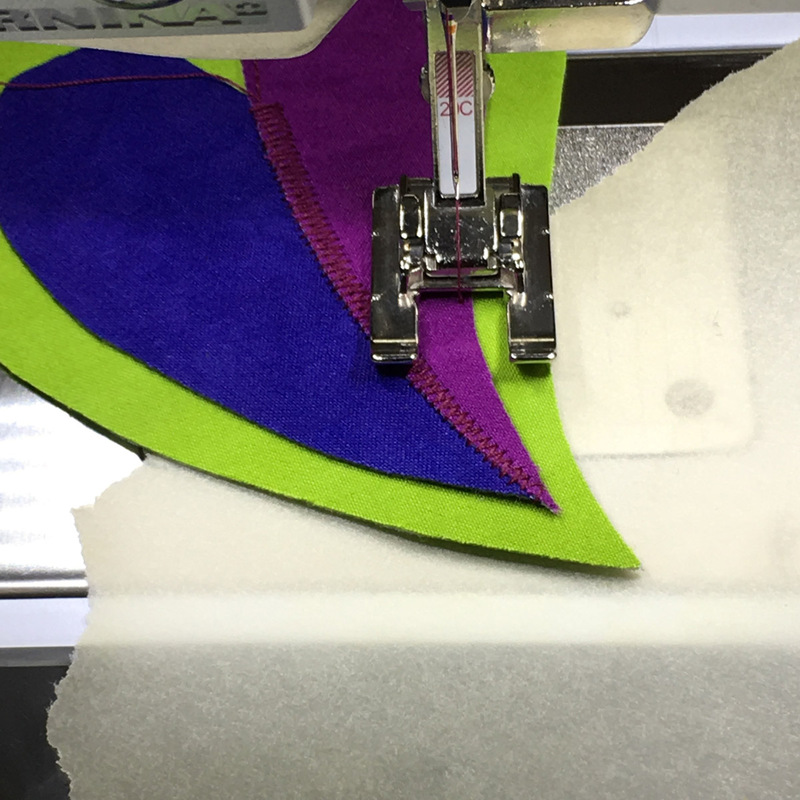 The interfacing gives the shapes more body and also acts as a stabilizer for all the eventual embroidery. 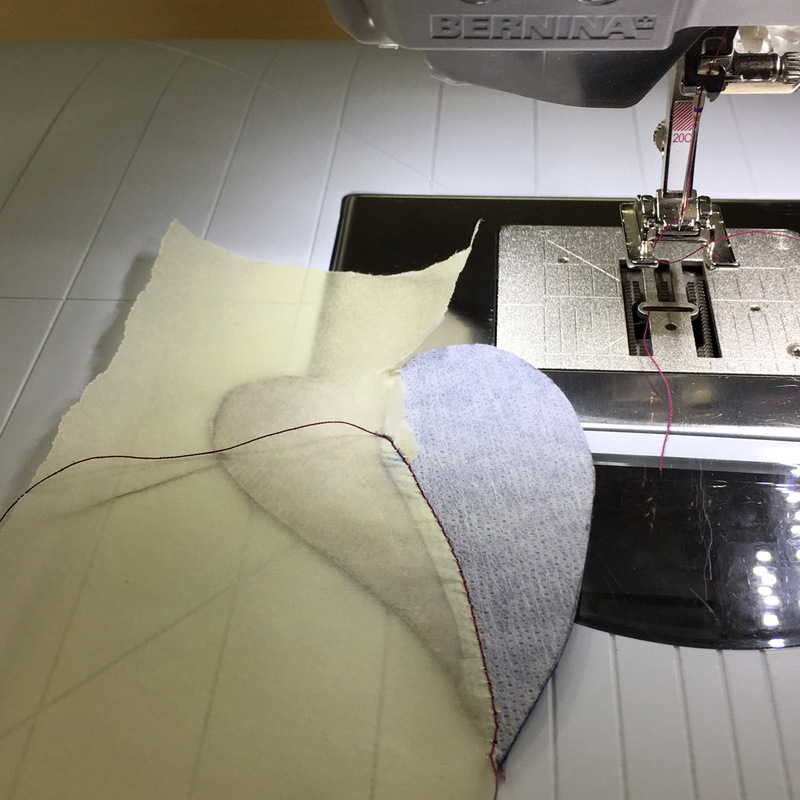 I like to do as much of the embroidery inside each shape before it gets attached to the background, since it is much easier to manage in the sewing machine. 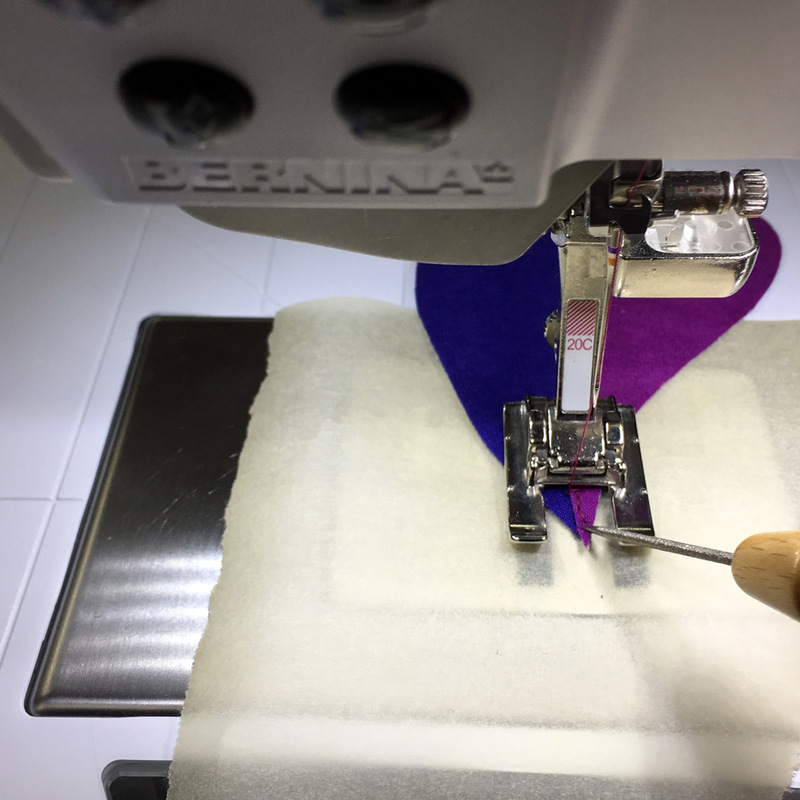 Notice I am using the Open embroidery foot #20, my all time favorite because it allows me to see exactly where the needle is going which is very important for precise embroidery work. 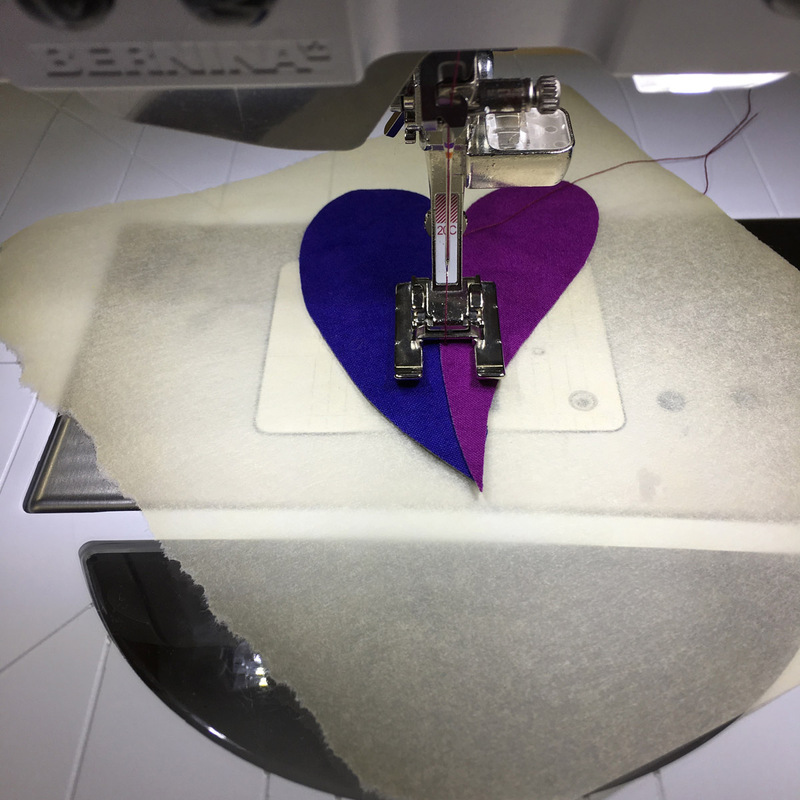 Some appliqué pieces are very small or have an awkward shape, like a sharp point, which can be tricky to control under the needle. This is when I use a piece of tracing paper (I use Golden Threads) under the shape to give my hands a surface to help guide the shape under the foot, and in this case, to keep the machine from eating up that nice sharp point. 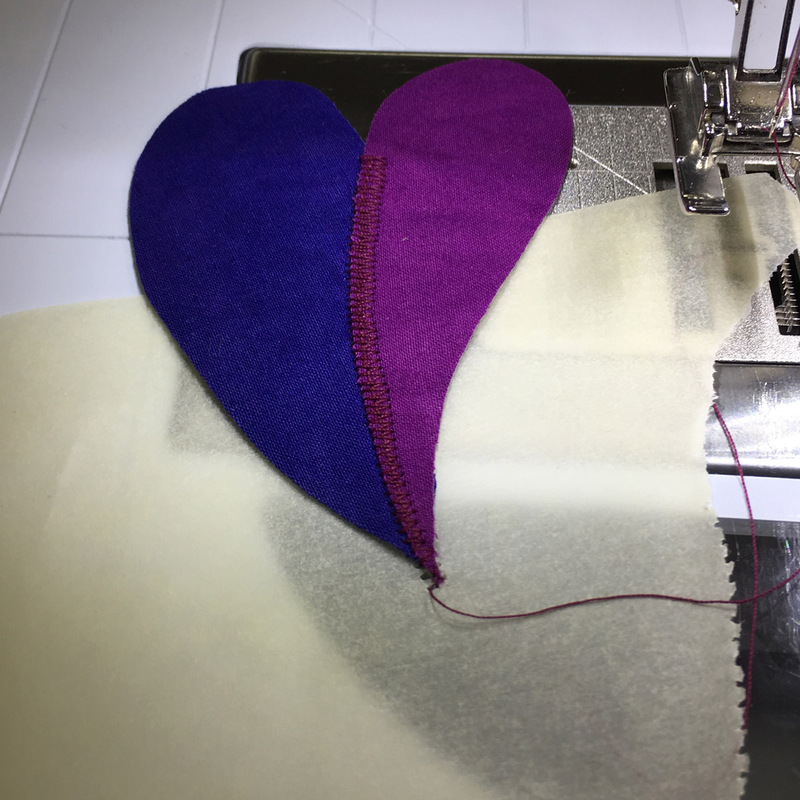 Here I have two overlapping fabric pieces that make a heart shape. I first use a matching thread to straight stitch the two halves together. 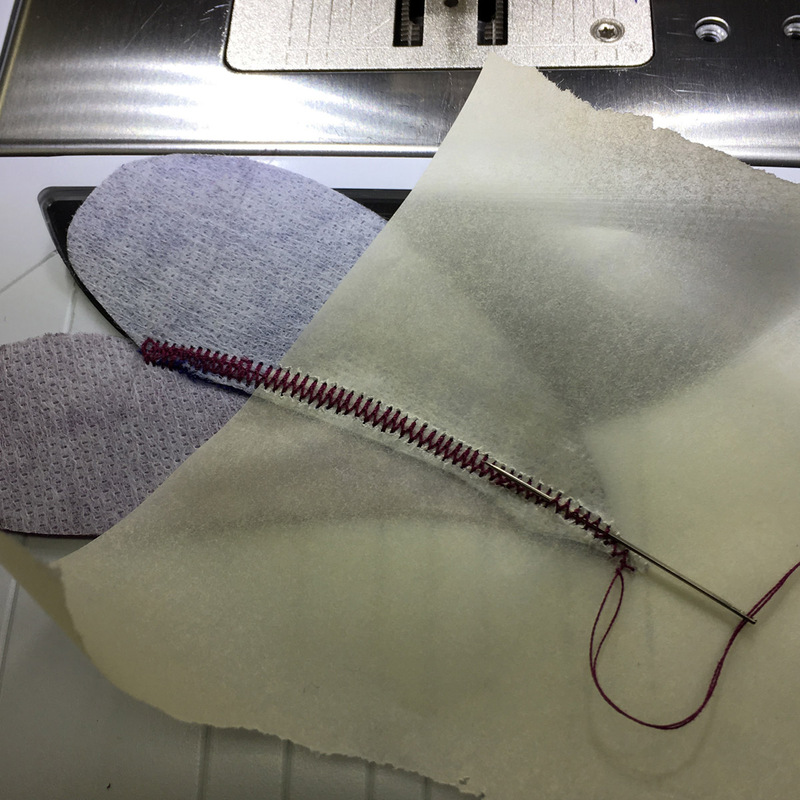 I am getting very close to the point and the paper prevents the tip from being pushed into the stitch plate and also give my fingers a surface to hold on to. BEAUTIFUL! The point is still intact and the two shapes are now one. Then I can easily tear off the perforated paper, pull the threads to the back of the shape to tie and clip. 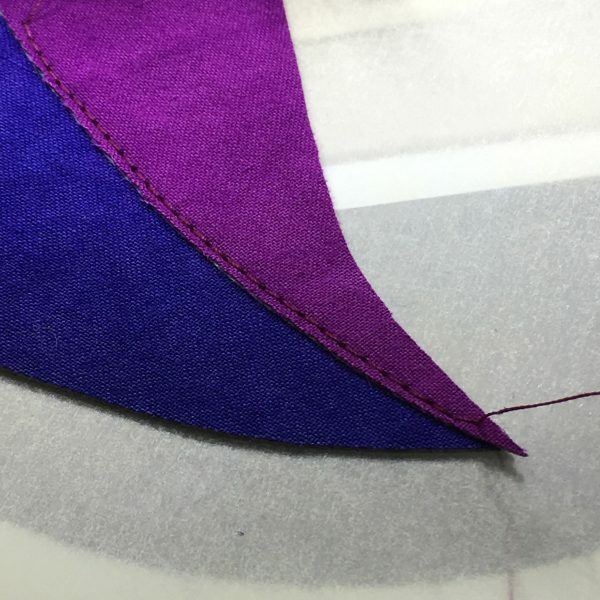 Next I want to cover the straight stitches with a decorative satin stitch. The needle goes directly in the ditch, which makes an easy guide to follow with the Open embroidery foot #20. Again I place some paper behind the shape to help guide it under the foot and to maintain that perfect point. 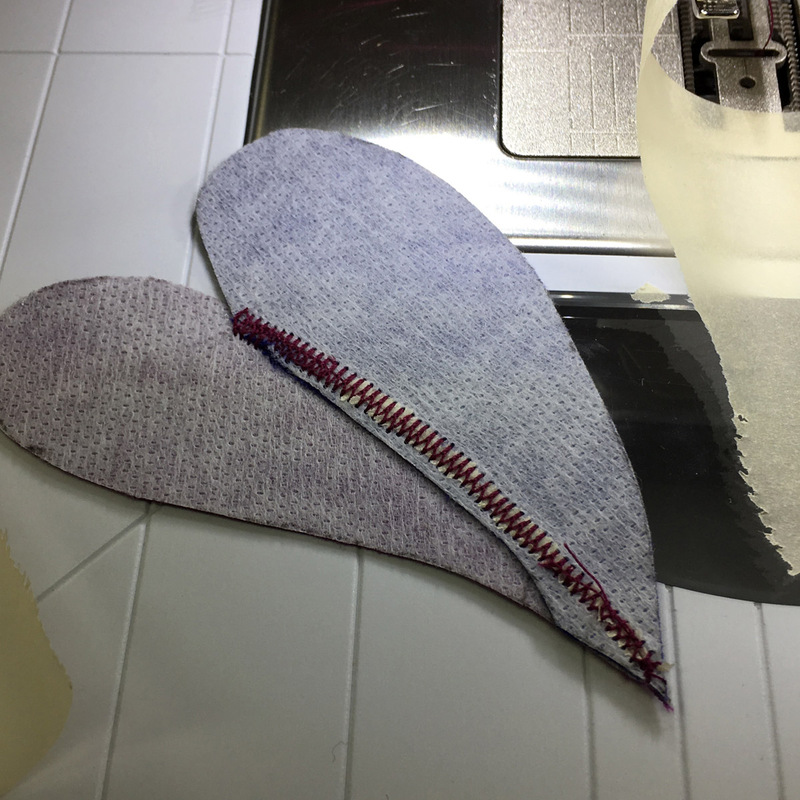 It is difficult to control the point, even with the helpful paper underneath, so I use an awl to carefully guide the pointed fabric under the foot. You can see that the paper has preserved the point nicely, once again! 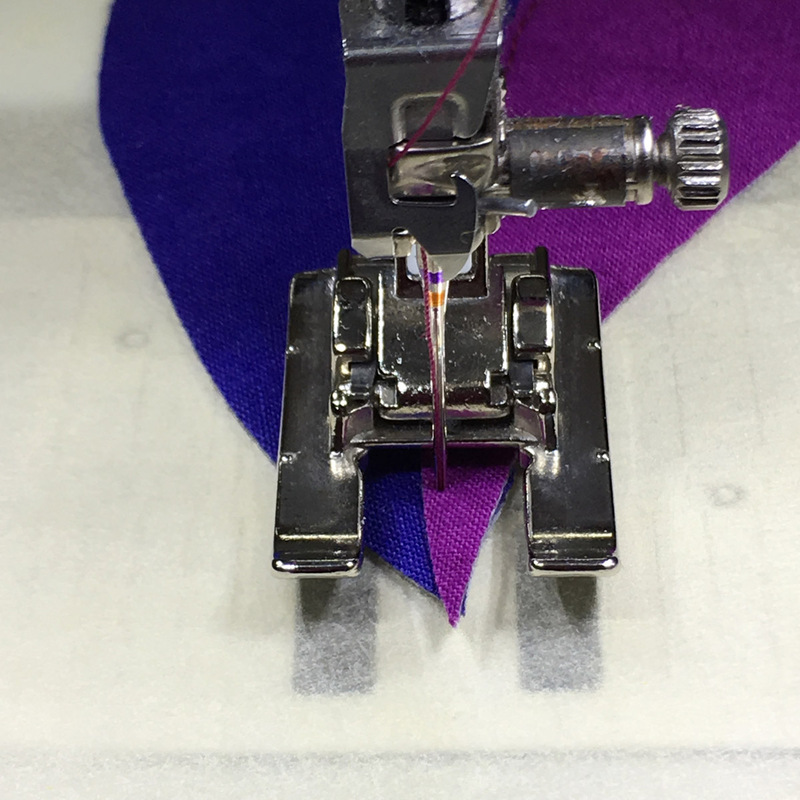 Then I pull the threads to the back and tie them before using an “easy threading” hand needle to pull the threads under the satin stitch and clip them. This keeps the tails from getting in the way later. 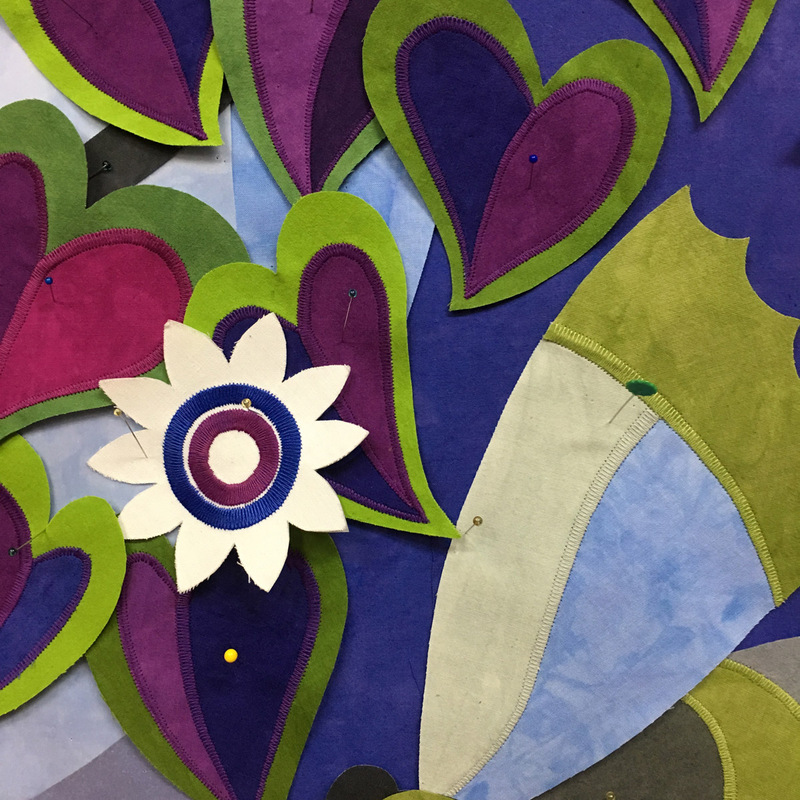 The paper is torn away and I have a completed shape which is ready to be added to a background layer. Then I repeat the same sequence of events as before…straight stitch around the outer edge of the purple heart to attach it on the green heart and finish the edge with satin stitch. Again I am using the tracing paper to help guide the awkward shape through the machine. Excellent and very helpful article. Thank you! Great time savings! Thanks for sharing. I’ve been known to also use tissue wrapping paper. Very helpful tip … thanks. Thank you for the appliqué tips. My next quilt will be entirely appliquéd. I’m ironing the fabrics today.